Farmgirl Fare: At Last! We Have A Winner! It's Been Fun Being Yellow 21, But I'm Ready For My New Name! *Note: In an effort to keep this post a manageable length, I chose to include links to many of the comments and entries that are mentioned, rather than put them in here. So you can read just what you see, or you can click on the links for the lengthier (and much livelier) version. What? You want to skip right to the end? Uh, yeah sure, go ahead. Just promise me you'll come back and read the whole thing, okay? It took me forever to put this together. After three weeks, more than 250 comments (on 70 printed pages), over 150 names entered, and enough laughing to burn off at least 400 chocolate babycakes (and that's just on my part), our lovely Yellow 21 has a brand new name. I have had more fun than I ever imagined--and the Secret Panel Of Judges had one heck of a time choosing a winner. We were tempted to take Cherrybegonia's advice and "name this sheep Grace because only by the the grace of God are you not going to give up and just keep Yellow 21!" And that was 40 pages of comments ago. Then there was Kitchen Mage's suggestion that we "declare Larb [her entry] to be of a culture where everyone gets 1000 names and dub her Larb Butterbean Muffaletta Pepper Coriander Matzo Ball Pecorino Pepato Clementine Kiwi Meringue Cashew Skittles Fluffernutter Sugarlump Marzipan Cupcake Chocolat Mocha Cappucino. As long as Larb is first." But we perservered. And while you can rest assured that all judging was done on the up and up, there were definitely some tempting offers. This lovely lunch arrived via e-mail from hopeful contestant Kat. Kitchen Mage, in her quest to make "Little Larblet" her own, put all her heart into baking some special bread in Yellow 21's honor. And Heather revealed a secret family recipe in hopes of swaying the judges toward the name Willow. But the most tempting offer of all had to be the one from Mathilde, who suggested some interesting Danish names and then added that she "would SO love to see the face of my boyfriend telling him I won a live sheep. He will be afraid she will have to live with me and the cat in too little space and he will turn all green in the face. I will promise you a picture of this if I win!". Because you are probably curious (and at the risk of hurting the feelings of other entrants--as Brett suggested, we really should declare "a hundred way tie for second place. "), here are some of the names that made it through the first rounds of judging. They are (in no particular order): Kiwi, Willow (or Woolow, as one the of judges preferred), Gemma, Emma, Missy, Matilda, Ewegenie, Chloe, Hannah, Estella, Darla, Fiona, Philomena, Tallulah, Lottie Lou, Mrs. MacTavish, Patience, and Grace. The judges also liked the name Patricia, which was suggested by Spiral, as well as the reasoning behind her choice. (Plus one of the judges thought it would be kind of cute to call her Fatty Patty when she was pregnant.) Spiral also did an admirable job of bashing every one of the previous entries. Once we had a list of finalists, our job became even harder. And while Yellow 21 has only one new name, the judges would like to call attention to a few contestants who, each in their own (sometimes slightly demented) way, rose above the throngs of other players and outdid themselves in their efforts to win themselves a sheep. Let's start with Alisha. She didn't enter right away, as she wanted to wait until she came up with the perfect name. And she did. It was Lydia. Which Karl had entered on the first day of the contest. Aghast at what she had inadvertantly done, she came back with an entirely different idea, a rather convoluted (and slightly frantic) explanation to go with it--and no new entry. That's right, for Alisha was willing to win only half a sheep as long as she knew it had the right name. We had to admire her for that. We also couldn't help but admire Brett, who confidently waltzed in and cleverly dissed more than 70 names with one click on the "Publish Comment" button--then left us with his entry of. . . Pecorino Pepato. Which he returned to valiantly defend not just once, but several times, armed with ammunition from such places as ThinkBabyNames.com and Wikipedia.org. In the final round of Pecorino's defense, he also offered up two contingency names: Ewenice and Coletta (the latter he brazenly admitted stealing right off the blogger Word Verification thingie that appeared when leaving his comment). Then we have Tana, who jumped right in, happy to show off her knowledge of sheep breeds (but who, despite the fact that she spends much of her days visiting small farms, still doesn't know what noise a sheep makes.) Tana submitted the name Rita Merino, and although I did publicly disclose Yellow 21's background here, specifically mentioning (for Tana's benefit) that Yellow 21 is not even 1% merino, she stuck by her name, popping by now and again to defend it when necessary. This was usually just when you thought she'd given up the fight--like last night at 5:44pm when a comment appeared out of nowhere saying, simply: "Ahem. Please click here!" And then there is Jeff, who lurks in the background at Culinary In The Desert, feasting on Joe's gourmet cooking and no doubt keeping the entire household in a constant state of hysterics. Jeff entered several names, but when he learned that one judge was getting a real kick out of his very first entry, Cashew, ("If you are raising her for any sort of profit-reasons....Cashew. As in...Cash-Ewe Hee hee hee!") he took the hint and ran like hell with it. At one point he even started channeling sheep. It's going to be awfully quiet around here without Jeff's witty comments peppering nearly every single post that I've put up since this contest began. He definitely outdid himself with this one. And that brings us to The Final Three. You probably know who they are. Sam. Lisolette. Wendy. There is no way I can even begin to rekindle the competitive (and absolutely hilarious) fire that was burning here this past week--and these three were definitely the ones most responsible for fanning the flames. If you haven't been following along with the contest, I can only urge you to go back and read the comments section of the original post, especially the second half of them. Now I'll do my best to give these girls the credit they deserve. Wendy was our latecomer, joining in the game just last week, but oh how she made up for it. She entered over 30 different names, starting with Mushmello. Then she really got on the ball--and just kept rolling. She also had me (and I'm sure many other people) rolling on the floor in fits of laughter with her wacky comments. (Don't believe me? Just try saying "Cream of Sheep" out loud with a straight face.) Wendy says she works as a barmaid, and, well, one can't help but wonder. . .
She eventually hit upon the name Marzipan, along with a bribe. Meanwhile, there was Sam. Sam, who entered just one name: Guinevere ("aptly meaning 'fair and soft'"). Sam, who faked technical difficulties on her own blog, Becks & Posh, so she could devote more time to the contest. And she has played fair alright, but she has been anything but soft on the competition. Last week I was absolutely thrilled when I saw that there had been a record number of visitors to Farmgirl Fare--and that the previous daily high had been broken by several hundred hits. Then I discovered the truth. There were no hundreds of new readers--it was just Sam, checking in every six minutes in the hopes of finding a newly entered name to bash. And when Liselotte first joined in by entering the name Karen, Sam was right there, ready to pounce on it. When Liselotte came back to check on her name, she saw that I had explained how I once had a sheep named Karen. She also noticed that I mentioned how I liked the name Liselotte and wondered why she hadn't entered it. And so she did. That was when Wendy jumped on the bashing bandwagon, and things really got going. Cupcakes and accusations were flying everywhere. When Wendy accused Liselotte of really being a man named Bubba, Liselotte calmly walked into the kitchen and put her culinary and artistic skills to work. And when Liselotte demanded to see Wendy's cupcakes, Wendy explained that she had been sharpening up her sheep raising skills. on Becks & Posh and went off to call in a few favors from some celebrities. Meanwhile, Wendy and Lisolette made their closing remarks. Three finalists and five strong competitors. But, of course, there can only be one Big Winner. And while we thoroughly enjoyed and appreciated Wendy's wit and humor and enthusiasm, there was no denying that her final entry was, well, Marzipan Cream of Sheep. Just not quite up to par with Liselotte and Guinevere. What to do? What to do? How to reward seven deserving players without dividing up Yellow 21 into little bits? And then it came to us. Alisha! This cutie pie was born in 2004 to Doll Face, and previously known only as Green 33. Congratulations, Alisha (the person)! You have received a Special Judges Award! Brett! Brett (the person), you have been named Best Basher! Little Brett was born this spring to Auntie Rose and used to be called Green 43--though she chose to remove her eartag. Click here to see another picture of her. Up next is Jeff. Jeff who, even as I sit typing this, is still leaving witty comments on other Farmgirl Fare posts. What can we say? This contest just would not have been the same without nuts. Congratulations Jeff, you have been given the Laugh Out Loud Award! And, if all goes well, five months from yesterday (how's that for perfect timing?) Yellow 21 will give birth to little Cashew! And if it's a boy? Well, then it'll just be Cash. . .
And that leaves us with Sam and Liselotte. To say this was a close call would be making a huge understatement. If this had been a horse race, it would definitely need a photo finish and a magnifying glass. Both players fought to the very end with unstoppable wit and charm and humor--and stamina. Both entered excellent names, and, really, both deserved to win. But, once again, Yellow 21 can only have one new name. The judges were stumped. We even put the question to Yellow 21 herself, though we did not expect any help since up to this point she had not responded in the slightest to any of the names we had called her: not to Snorf, not to Tallulah, not to Patience, not even to Marzipan Cream Of Sheep. Nothing. Not a twitch. So what happened when we called out the final two names to her? Well naturally she answered to both of them. It was back to us. We thought long and hard, and we finally figured it out. What does it all come down to in the end? Not who bakes the best cupcakes. Not who you know in high places. No, what it all comes down to in the end is Love. And while we can only assume that Sam was planning to love Yellow 21 with all of her heart, she never actually came out and said it. And Liselotte did. Yes, we realize Becks has food all over her chin, but as a diehard foodie we figured that Sam would understand. Becks (who used to be called Green 42) was born this spring to Trixie, a triplet whose mother is Mary (Doll Face's triplet sister). Click here to see another picture of Becks. 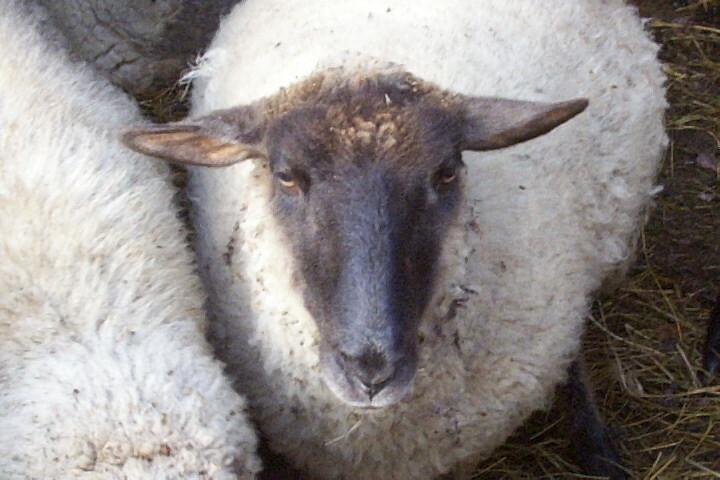 And Posh (formerly known as Green 32) was born in 2004 to Clare, one of our oldest and dearest sheep. Click here to see another picture of And Posh. Phew. That means all we have left to do is say Goodbye Yellow 21. . .
That was worth waiting for! Congratulations to Liselotte on her self-named sheep...you will let us visit her, won't you? We've gotten somewhat attached. Congrats on the new name, Liselotte! 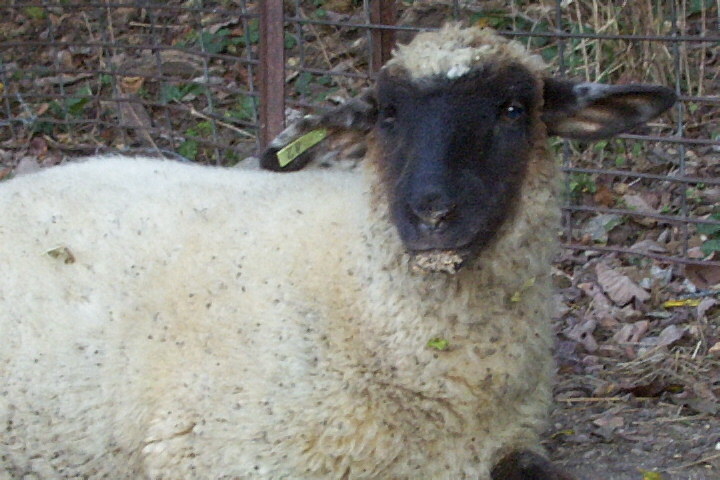 But I'm still sad that my sheep went to someone else. *sigh* Oh well. Now I just need to go out and get a farm. This was wonderful, and now I have many many links to new blogs to read. Thanks for everything, and I can't wait to hear how the Sheep grow up and become... um... big sheep? Whatever sheep become. Well done Liselotte. Lovely name. 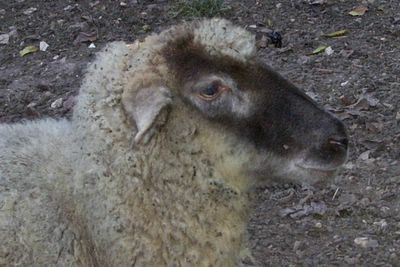 A "slightly older" sheep named "Tana"? Will there be a movie now? Funny, there's something in my eyes too. I have laughed so much the last couple of days reading the comments. Thanks to you all! Everyone should have the name they are the most happy with, Susan. Wow! At last the girl got her name! ::applauding the judges:: You did a great job (imagine all that linking and typing while lol phew). And my blog was linked to as well, so now i am the happiest newbie blogger around, picture me waltzing around the room cheering while the family goes like okay NOW she finally lost it. Funny little white jacket they bought me, with the sleeves going round the back. I hope for new visitors who will leave comments as the Dutch haven't got any clue...yet. They just read and don't comment. 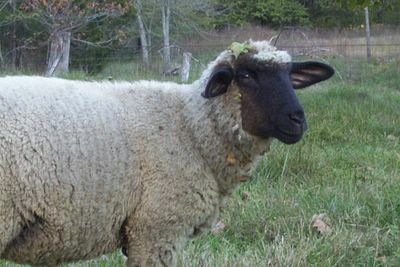 I'm so totally in love with her allready and I'll have to make her very own banner, to let everyone know, that there is a sheep named Liselotte at FarmGirl in Missouri. I've got two kids. Alexander (15 years old and disabled) and Oline (a girl 11 years old) and they both are totally falling in love with her too. My daugther was so excited: "Wow... is she really gonna be named Liselotte? Is she really?" and we all had a alot of fun getting the globus to find out where Missouri is. She's got the banner now! 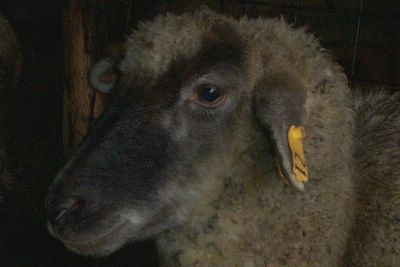 Congrats on your new sheep Liselotte! You definitely deserve the honor for all the effort you put into it. And I must say that is a lovely banner. Fantastic roundup of names, Susan. My bribe, er, uh... must have gotten lost in the mail. It could have been Kiwi! Ah well. You got a bunch of great names out of this, though. And I bet that Liselotte, a.k.a. the sheep formerly known as Yellow 21, must be very happy. BTW, how do you properly pronounce "Liselotte" - I bet she can't even pronounce it!! what happened to my incredibly funny comment I left SOOOOO LONG AGO? That was the BEST roundup EVER!!! all those names, so many sheep! This was so damned funny and heartbreaking and wonderful all at the same time. Great job, Farmgirl. I have to say, I'm slightly perturbed, however, that I'm noted only for making a mild threat. Oh great! I'm the psychopath around here! Oh well. Once I read that Lisolette's children are gathering around the computer, clamoring to see the sheep, fervently hoping the dear animal is named after their mother? All bets are off. We have a winner. So I lost the contest for not publicly professing to love the sheep. Rats. Hey Farmgirl - well what exactly do you want from your comments anyway? Don't tell me you really prefer all that sycophanticism over sharp gut-busting wit that makes you fall on the floor sobbing with laughter?? May I suggest a name for Liselotte's first born lamb? Oooooh. All my life I have longed for such a chicken namesake. And she's a beaut. A fine feather on that girl. Perhaps you could let me know when her birthday is, so I can commemorate it annually. C'mon Lindy. Remember - you didn't actually win the chicken, it's just named after you that's all. Lindy the chicken should be greatfully celebrating your birthday and not vica versa. She should be practising laying some eggs in preperation for the cup cakes she is going to send you! Yay! What a happy ending. Congratulations to Liselotte (and her lucky children--now we know who got to eat all those lovely baked goods)! Thank you for naming that other beautiful sheep after me! What a surprise! I don't deserve it after my rather baaaaaaad behavior (I took your encouragement to "suggest why the other names shouldn't be chosen" a bit too seriously). Sorry, folks. I've been working in uncivilized restaurant kitchens too long! What a great contest and round up, FarmGirl! Now I've got to go off to munch on some grass. brett - there is way too much civilization on blog comments. I loved your trashy entry. LOVED it! DOn't apologize. It was all in the pirit of the ting. I am happy you have a sheep named after you - especially as you begin with a B! Well, okay. 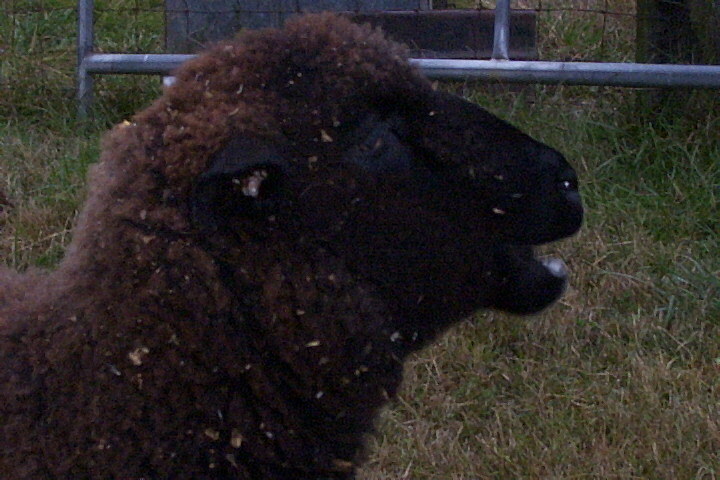 My ignorance was revealed when I disclosed that I didn't know that sheep ate hay. Apparently there's a few other things I missed too. Like hens baking cupcakes, Sam. I thought they went in for like, whole grain stuff and what have you. Insects, and so on. Of course, the Lindy chicken does have the look of a bird who is, shall we say, above average. Wahh! Wahh! I didn't win!! Sam, ha, ha, ha! Second place. Ha. At least Shauna and I were mentioned way up high in the post -- and Shauna was the baddie, not me. Still. Liselotte is such a pretty name. First, I would like to say congratulations and hello to Liselotte (I'm really sorry, but she will always be Lydia to me-close enough, though!). Secondly, OMG, how cute is that Alisha? I mean, those eyes, that mouth, that bee-yoo-ti-ful curly hair...how could you not just eat her up? Alisha means "truth", a very noble name indeed. She also makes a darn fine screensaver! I am going to write a tribute to her over at my place right now! This contest has been so much fun, Farmgirl. You are truly one of a kind. You have a beautiful spirit, and it shows through on this blog, and reaches everyone who visits. That's good people, to me! P.S. Keep up the goat pictures!!! FG, I've been thinking, and I just have to express my dismay at the results of this contest. 1. The Secret Panel of Judges picked a really beautiful name. 2. Liselotte (the human) is such a sweet person and has demonstrated she will provide plenty of love to Liselotte, the Sheep. And her kids - adorable! 3. You did such a fantastic job with the whole thing, especially the final post - OMG you rock! 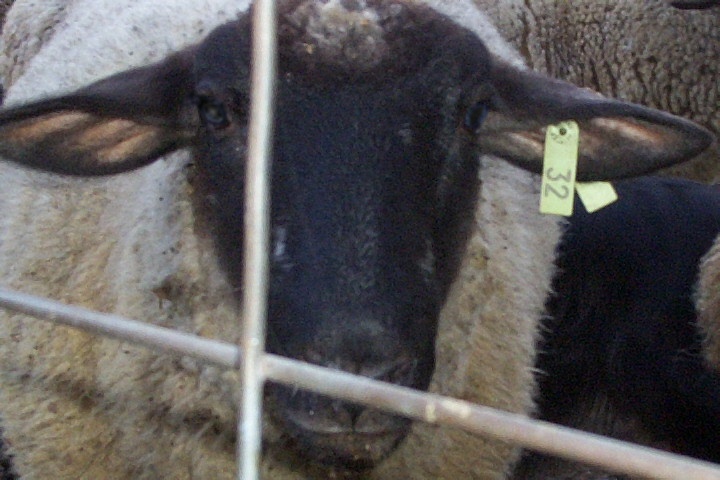 Do you have other animals than sheep in need of a name? Congrads liselotte! And I wont call you Bubba any more. Thanks farm girl for all the fun.I just love my sheep. So cute. Love that. I need more time jujst to read all the crazy comments! Well, I suppose I am happy for the sheep, my children are very dissapointed though. You see farm girl, I had already promised them an honary Aunt Farmgirl(refer to my entry post if you need refreshing!) I guess using your children as bribary just isn't worth what it used to be!!!! Farmgirl, this was GREAT!! We all had so much fun, thanks! Thanks so much for all of your wonderful comments. It's great to hear that so many of you had almost as much fun as I did with this contest. I honestly cannot remember laughing this much in my entire life. Liselotte seems very happy with her name. And even more happy to be out of the spotlight! I felt like a member of the paparazzi chasing her around with the camera this past week. Linking and typing and laughing out loud is definitely a difficult combination. And everyone wouldn't quit leaving me hyserical comments--right down to the last few hours. It was fabulous! We'll get people leaving you comments on Bake My Day don't worry! Thanks so much. The hard work was my absolute pleasure. This contest was a riot! Just can't trust the post office. Somebody down there probably ate your bribe! And Liselotte the sheep is indeed very happy. The contest would definitely not have been anywhere near as much fun without you. Thanks for putting all that time and effort into it and for the nice write-up on Becks & Posh. P.S. Do you think you can you get me Ivor The Engine's autograph? So glad you like your chicken! She really is pretty; she's received several compliments on her good looks. Hmmm. A good layer? Well, she used to be. The girls seem to be on laying hiatus right now. As for her birthday, I'll have to search my records, but I do believe she was born in April of 2001. She arrived in a box at the post office along with 26 other 1-day old chicks. Talk about adorable! Wish I had baby chick pics to show you. You are definitely right that Lindy chicken is above average. And she already is a blogstar. That's right. This is her. And so is this. Yep, that's right. She lives with Whitey! P.S. Just wait til you read about what Lindy and Whitey did this summer. I'm hoping get it all written up soon! P.S. Did anybody ever tell you you're nuts? Other animals that need names? Hmmm. Just these two. Wonderful to hear from you! I was afraid you'd expired (or exploded, or whatever it was you thought you were about to do) during the interminable wait for the winner to be announced. So glad you had fun and love your sheep. Silly Wendy really is a sweetheart. I have this theory. I call it the Big M theory. I shoot them out she catches them. I say Mmmmm yummy a lot/farm girl says Mmmmm chocolate a lot. Farm girl has a cat named Molly/I have a kid named Mushmello. Farm girl lives in the Middle of nowhere/I live in the Middle of Michigan. We are kindred spirits. Cant you see all the m's. Marzipan it was meant to be. My mom confessed to me yesterday that she'd just spent 90 minutes reading comments! They definitely are crazy (in a good way). Read them when you really need a laugh. (Don't blame me, you started this.) 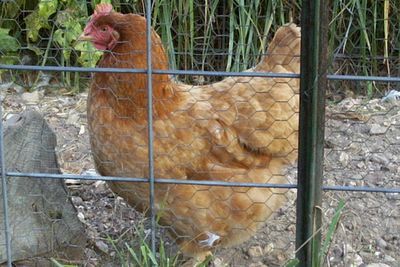 What are the rules on the chicken names? I vote for Mathilde and KitchenMage--the first because she asked and the second because I did too. And I LOVE chickens. LOVE, LOVE, LOVE, LOVE, LOVE, LOVE, LOVE, LOVE, LOVE, LOVE, LOVE, LOVE, LOVE, LOVE, LOVE, LOVE, LOVE, LOVE, LOVE, LOVE, LOVE, LOVE, LOVE, LOVE, LOVE, LOVE, LOVE, LOVE, LOVE, LOVE, LOVE, LOVE, LOVE, LOVE, LOVE, LOVE, LOVE, LOVE, LOVE, LOVE, LOVE, LOVE, LOVE, LOVE, LOVE, LOVE, LOVE, LOVE, LOVE, LOVE, LOVE, LOVE, LOVE, LOVE, LOVE, LOVE, LOVE, LOVE, LOVE, LOVE, LOVE, LOVE, LOVE, LOVE, LOVE, LOVE, LOVE, LOVE, LOVE, LOVE, LOVE, LOVE, LOVE, LOVE, LOVE, LOVE, LOVE, LOVE, LOVE, LOVE, LOVE, LOVE, LOVE, LOVE, LOVE, LOVE, LOVE, LOVE, LOVE, LOVE, LOVE, LOVE, LOVE, LOVE, LOVE, LOVE, LOVE chickens. And I won't even mention that you said "soon"--at least not after this. 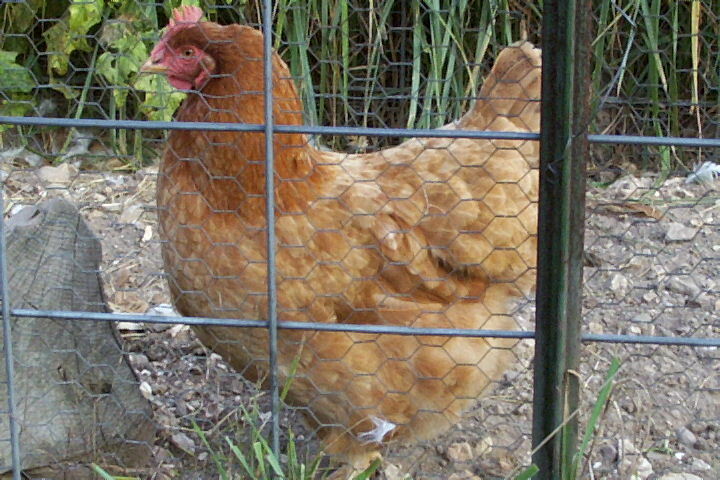 Did I mention I love Mathilde and KitchenMage, the two prettiest chickens ever? LOVE, LOVE, LOVE, LOVE, LOVE, LOVE, LOVE, LOVE, LOVE, LOVE, LOVE, LOVE, LOVE, LOVE, LOVE, LOVE, LOVE, LOVE, LOVE, LOVE, LOVE, LOVE, LOVE, LOVE, LOVE, LOVE them. I am deeply disappointed. I am depressed. I am such a well-behaved contestant, who didn't diss anyone's idea except naming her "cheesy sheep" in Italian. Next time I will have more spare time and I will misbehave enough to win! Oh, I just love the name Liselotte....good choice, FG!! This post/contest was so much fun and I totally enjoyed those consolation sheep, too! Are those roosters that are needing a name? Because if so, Po' Boy (Sandwich) would not be at all a bad choice, in my view. I suspect Lindy the chicken will support me on this, if you check with her. I think Liselotte is a lovely name...I have a thing for 'L's and the way they roll off your tongue. I was thrilled to see that Tallulah made it through the judging panel's first round! You have a wonderful, imaginative site and it's always a pleasure to stop by. Okay, I have determined that all of you, every last one of you, are certifiably, deliciously insane. Thank you. Liselotte.... a sheep by any other name would smell as sweet. Thanks for mentioning my 'Grace' entry! I was on holidays and I was not at home the day of the results. Unbearable suspense, terrible wait. Liselotte, what a beautiful name. I am SO glad you explained all this. 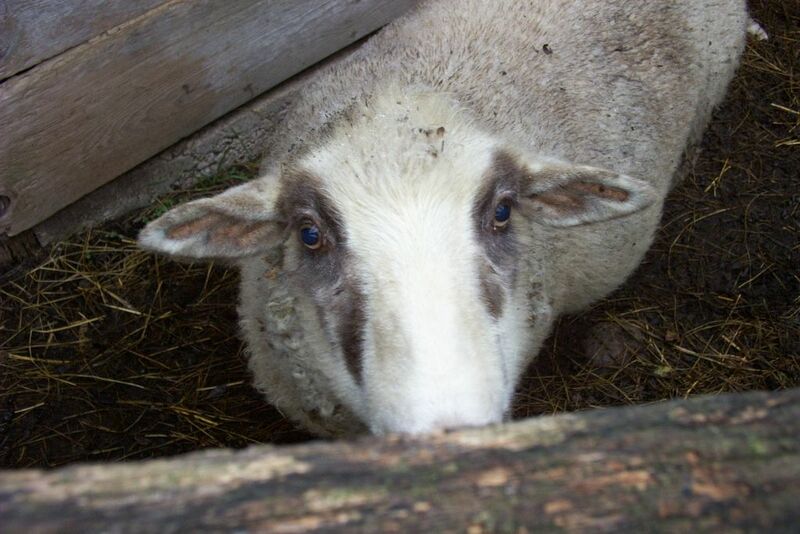 I was reading Liselotte's blog and I was wondering if she WAS a sheep. Whew. Oh, and my daughter is a Wendy. She likes sheep, but is being swayed by Llamas lately. Oh my gosh! Liselotte is my Mom's name. I just love it! So nice you named a sheep that, isn't in a lovely name? Suits her well.